All India, 30th January 2019: Yas Marina Circuit will welcome the world’s best, and fastest, rally drivers for the inaurgral FIA WORLD RALLYCROSS CHAMPIONSHIP, held at Yas Island, Abu Dhabi. 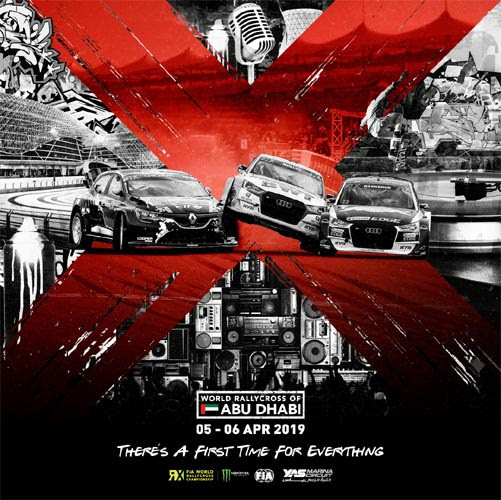 In another exciting and dramatic first for Yas Marina Circuit, the 2019 FIA WORLD RALLYCROSS CHAMPIONSHIP will feature the first-ever night race, with cars tackling the circuit’s custom built track under the floodlights. Held over the weekend of April 5th to 6th 2019, Yas Marina Circuit’s hosting of the international Championship is a further boost to its credentials as the ‘Meeting Place of Champions’. Some of the world’s most talented drivers will compete for glory across the Championship’s thrilling Supercar and RX2 classes that feature a range of powerful, highly modified and super fast versions of regular production cars. Two-day (Friday and Saturday) tickets include will include the best in on-track, off-track and after-race action with practice and qualification sessions as well as the final thrilling race day and supporting races. Fans can also take part in all-access public pitlane walk and specially created Rallycross experiences. Families can make the most out of their time on Yas Island by opting for the ever-popular X-Parks Pass when purchasing their tickets for the FIA WORLD RALLYCROSS CHAMPIONSHIP. The exclusive tickets provide access to Yas Marina Circuit as well as unlimited access to Ferrari World Abu Dhabi, Yas Water World, or Warner Bros World Abu Dhabi from Thursday to Sunday. The FIA WORLD RALLYCROSS CHAMPIONSHIP is part of Yas Marina Circuit’s exciting, comprehensive and dynamic year-round calendar of motorsports events that includes single seater championships, endurance races, street-style drag events, and the season-ending FORMULA 1 ETIHAD AIRWAYS ABU DHABI GRAND PRIX. As part of a packed weekend, Yas Marina Circuit will be transformed into a festival of on- and off-track entertainment, with family-friendly F&B activations, go-kart challenges, driver meet-and-greets, live music and shows by local musicians and entertainers, plus a Friday after-race concert exclusively for ticket holders. More details on the after-race concert will be announced soon. The roaring start to the FIA WORLD RALLYCROSS CHAMPIONSHIP season is supported by key stakeholders Yas Island, the Abu Dhabi Department for Culture and Tourism, and the Abu Dhabi Sports Council. Al Tareq Al Ameri, CEO of Yas Marina Circuit, said: “The FIA WORLD RALLYCROSS CHAMPIONSHIP is an exciting addition to Yas Marina Circuit’s motorsport & entertainment calendar and it’s great news for fans in the UAE and around the region. “Rallycross is an exhilarating championship that spans the globe. Yas Marina Circuit’s hosting of the opening race of the 2019 season a fantastic endorsement of Abu Dhabi’s standing as one of the best locations for motorsports in the world.